8 – 10 small squid – the ‘pouches’ should be around 6-8cm long. Heads and tentacles removed and the pouches intact. They need washing very well to remove any sand. Have the squid ‘pouches’ washed and prepared and ready to stuff. Put the 3 tablespoonfuls of olive into a sauté pan and heat, add the finely chopped leek. Cook gently until it starts to caramelise. Add the rice and toss it with the leeks for a couple of minutes. Add the parsley and dill and mix well. Now add the grated tomato and add about 200ml of water and season with salt and pepper. Cook the rice and herb mixture for about 10-15 minutes over a moderate heat until the water has been absorbed and the rice is half cooked. When it has cooled sufficiently, take each of the squid ‘pouches’ and fill with rice mixture. It is important not to over fill the squid, as they may split as the rice expands. Close each of the pouches with a toothpick. Keep any extra stuffing and put back to finish until the rice is properly cooked. This you can use when serving up the stuffed squid. Heat the remaining oil in a casserole pan and add one of the chopped tomatoes and the wine and about 150ml of water. Allow this to cook for about 5 minutes, add the seasoning. 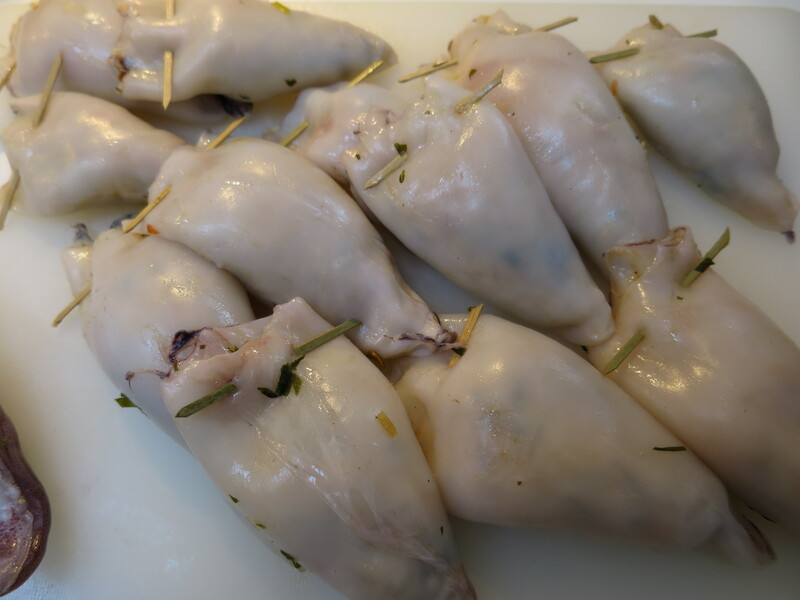 Now carefully put the stuffed squid into the pan – you may need to add a bit more water, it should not cover the squid. Cook over a moderate heat, turning the said over occasionally, for about 20 minutes or until tender and the rice has cooked. Serve on a warmed dish, with any remaining rice stuffing and scatter over the second chopped tomato.